British designer Suzanne Dean felt jarringly out of place. After studying at Kingston University, she found herself working on packaging and photo shoots for a design company, essentially “moving berries around backgrounds for ice cream,” as she recalls. One day, while working on a yogurt package for a food conglomerate, she decided to use a Gustav Klimt–style illustration to depict the bacteria. It led to an epiphany—and a career change. Having never designed a book cover, she landed a gig at Penguin UK, where she excelled, eventually rising to creative director at Vintage Penguin Random House. Today, she oversees the core team there while continuing to design her own jackets. The secret to her seemingly instant success as a cover designer? After landing a couple covers for high profile titles (including Donna Tartt’s hit The Secret History and Barry Unsworth’s Booker Prize-winning Sacred Hunger), she enjoyed the rare experience of seeing her early work out in the world en masse. Still, she says she didn’t know anything about book design when she started, so she didn’t know what the limitations were—or weren’t. She unwittingly pursued experimental production methods that were new to the publisher, and produced a series of brilliant and innovative covers early on. And then there’s her long-standing belief that input leads to output. She finds visual inspiration everywhere in the world and continually documents it on her iPhone. “I feel like I’m a magpie, going around sort of collecting things the whole time,” she says. It may take days or even years for it to reemerge and manifest as a book cover, but as these five designs prove, input can indeed engender output, in the most delightful of ways. Politics is a novel about a ménage à trois relationship—and thus Dean initially came to the table with a set of slightly risqué ideas that played on that concept. But Dean says author Adam Thirlwell wasn’t a fan of the direction, and instead wanted to utilize a photograph by the late artist Inge Morath. The composition of the image didn’t allow for any smooth type treatments, so Dean went in a fresh direction, incorporating it into a Constructivist block print aesthetic. Doing so allowed her to situate the photo in a natural way, and the overall concept spoke to the balance of power between the book’s three core characters. To execute the design, Dean made the blocks by hand, and pasted up the lettering to give it an authentic period look, with a slightly curved, handmade feel. She recalled the RBG exhibition by Italian duo Carnovsky, who specialize in overlaid imagery in the three additive primary colors, allowing different forms to rise to the fore when examined under colored lights. And there, she found her answer. Dean began meticulously combing the book and making a list of the eclectic items found within its pages, from crabs to scorpions to satellites. She brought Carnovsky on board. A major theme in the book is surveillance, and so Dean and the duo conspired on a design that would reveal new, secret details, depending on how it’s viewed. People often discuss the merits of perfectly paired copywriters and art directors, or tightly bonded editors and designers; Dean’s work is evidence of the brilliant output that can result from yet another well-oiled team: designer and production guru. Dean loves toying with the constraints of the printed book, and with The Book of Numbers she wanted to go bigger (literally). She decided to make the jacket a circular poster that could be pulled out. It was ultimately up to her production coordinator to make it happen, and he did, miraculously finding a solution that was both financially stable and fully functional. And while every designer loves a poster, why a poster for this project, exactly? Turns out, it was a savvy financial move. The production coordinator “worked out that if we didn’t have any foils and embossings and things like that on the cover, it would cost the same to do this circular grid and fold it down. Which is amazing, isn’t it? So that’s why we did it,” she says with a laugh. Dean’s design process begins by reading the manuscript cover to cover. She makes notes. She “magpies” and collects things that resonate with her in light of the text. Then she assembles them into large mood boards on her walls. She absorbs. She waits for the visual ideas to come. But sometimes—rarely, only about 10% of the time, she estimates—it’s easier, and that was the case with There There. In an earlier foray of magpie-ing, Dean had come across the work of woodcut artist Bryn Perrott, which she squirrelled away in a folder on her computer. Immediately after reading There There, which weaves together stories of contemporary Native American characters, she realized it would be a perfect fit for Perrott’s style. “There There is such an amazing title, and it meant that I could use it really big—instantly I knew that I wanted type that was hand-cut and huge. After working on the lettering, she sent it to Perrott, who made a woodcut of the feather with blood drops. Dean scrubbed away a few bits of the woodcut to make it interact with the title that ran beneath it, and then it was done. No changes required. A red foil completes the design, making it leap off the matte background. The Master and Margarita happens to be one of Dean’s favorite books, and working on a series of six Russian classic reissues for Vintage marked the third time she got to design it—a positive thing, in her opinion. “It gets easier, because you see the essence of the book easier,” she says. The series marked the 100th anniversary of the Russian Revolution, and Dean had to develop a unifying concept that would work across books ranging some 100 years apart in their initial publication. She found inspiration in the textiles of traditional Russian dress, which mix dramatically different fabrics and patterns together. Dean contacted New York City textile expert Susan Meller, who provided a range of samples that Dean pored over, carefully pairing different looks to each book in the series. Another production luxury, if not miracle: including real 3D glasses with a book. Initially, Dean and her team were tasked with creating covers for a series of reissued classics, including Planet of the Apes and Journey to the Center of the Earth. Given that the books in the series were sci-fi with a B-movie flair, Dean wanted to pull from references like pulp and retro 3D-styles. The challenge is that upon entering a bookstore, one is not already wearing 3D glasses. So the books had to be carefully crafted to retain legibility and work in 2D as well. Dean pulled it off—and her production coordinator even figured out how to economically include the glasses. 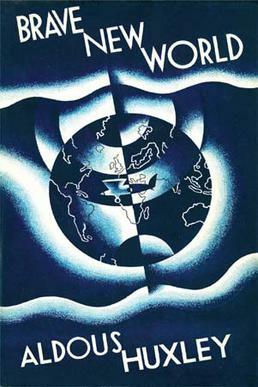 The resulting books were such a hit that the publisher asked her to take on Huxley and Brave New World. La Boca turned in a masterful design that echoes the globe and plane motifs of the original, while paying homage to its typography, which spins off from its dotted framing—all in fully functioning 3D, of course.